Sugar and spice and all things nice. This charm bead set is frivolous and fun. Spring has sprung! The Easter bunny's hopping about and all is right with the world! I've been having a lot of fun with tricksy colour combinations and unusual designs. 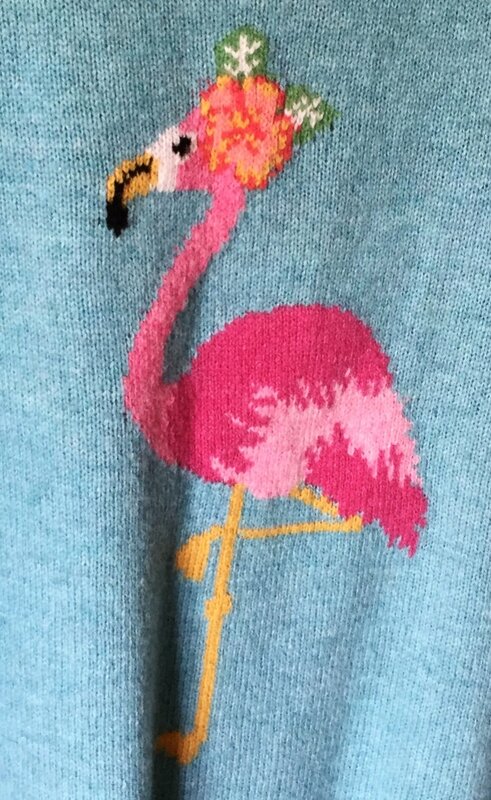 It actually started with this flamingo jumper. I decided to use the colour theme as the palette and see what happened. There was a kind of sea foam greeny blue, a rich yellow, a candy pink, a lilac, a more puce pink and a tiny hint of grass green here and there. I wanted them to look like candy or jelly beans and even did one with twirled candy stripes! Coming up to Easter they seem quite fitting! New Bright and Breezy Necklace! New for 2018. Bespoke necklaces, made to measure. Each bead can mean something special and particular to the wearer. Choose your colours, choose your shapes. The only limit is the imagination!! This particular set was inspired by this pot of tulips! I was dabbling about the other day making some beads for the BOC (Beads of Courage a fabulous charity that needs loads of support,) and started doing some little character girly beads. I got quite carried away! There are going to be loads more where these came from I can tell. Any name ideas you have, let me know!! It's sort of apt with the suffragette 100 year anniversary in a way and a bit of fun too! Go girls!! "These fishy themed beads were made to go with a special Christmas present ..."
I was very chuffed at Christmas because my Mum bought me a lovely Trollbeads silver fish for a present, so while I had a bit of time over the holiday, I thought I would make myself some fish themed beadies to go with it. I have always loved the concept of a 'Winter White' outfit! It's not very practical but all of those lovely mixtures of cosy cream knits, pure white and maybe a touch of silver grey it my favourite kind of look during the chilly months. I love all that layering and I think it gives a feeling of sophistication but understated elegance. White and black beads are always a good neutral option and go with this look well, but over the holiday I thought about making a set of beads for me to put on my Trollbead bracelet and necklace that used a more subtle colour palette and I was so pleased with the results. If you look up 'winter white' on pinterest you will find lots of lovely pictures of winter white fashions and clothing combinations so I wont put any here, but some images that help bring my idea to life and served as inspiration for my work at the torch are shown here. You may remember that a little while ago we had a bit of a cold snap and had snow here for a little while. I think this is what started me off on the idea. This was a couple of views out of my window on the Sunday morning when I woke up. I love the creamy hues merging into oyster as the sun comes up paired with the ever so subtle bluey white of the snow. For me the idea is all about the juxtaposition of the cold with the warm. Pure and crispy icy whiteness reminiscent of deep and crunchy snow underfoot or the ice cold wind whipping past your face, combined with an overcast and heavy sky that offers a silver grey atmospheric contrast, all that joined with the warm creams of fluffy blankets, log fire warmed cheeks, cashmere cardigans or the biggest latte coffee held in both hands that brings warmth into your bones. ..and Pixie Dust for Sparkle! I was really happy with them all in the end so can't wait to wear them! The only thing I might need now is a new 'Winter White' outfit to go with them!!! Hee Hee! Let me introduce Missy a lovely little tricolour tortoiseshell cat. One of my lovely customers (the same lady that gave me the reptile and snake beads job), asked me if I could recreate Missy's fur in a set of beads!! Well! I didn't know if I could make anything remotely acceptable but thought I would give it a whirl. I remembered a technique that I used for the set of garden beads (from the "How does your garden grow blog" for the 'Sunlight Through Hazel' bead pictured above) that I thought i might be able to use as a start point so I started there and played around a bit. I had quite a few sessions at the torch trying to get colours and textures right and eventually I felt like I was getting warm. 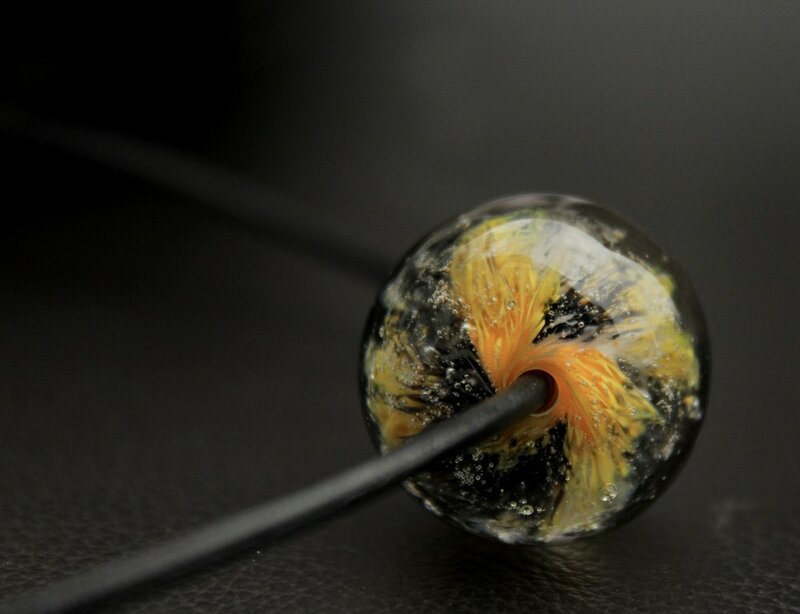 Here is a bead from the final set with Missy's picture! 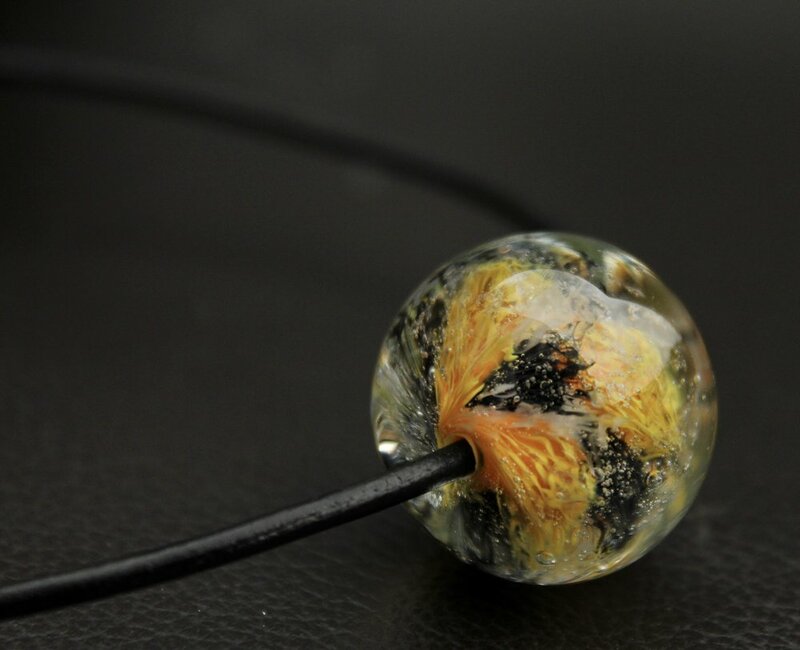 The added factor (which makes it quite exciting) is that orange glass looks blacky brown when it is hot so when I had the bead in a semi molten state and started to build up the texture, I can't tell fully where the orange sections end and the black sections begin. 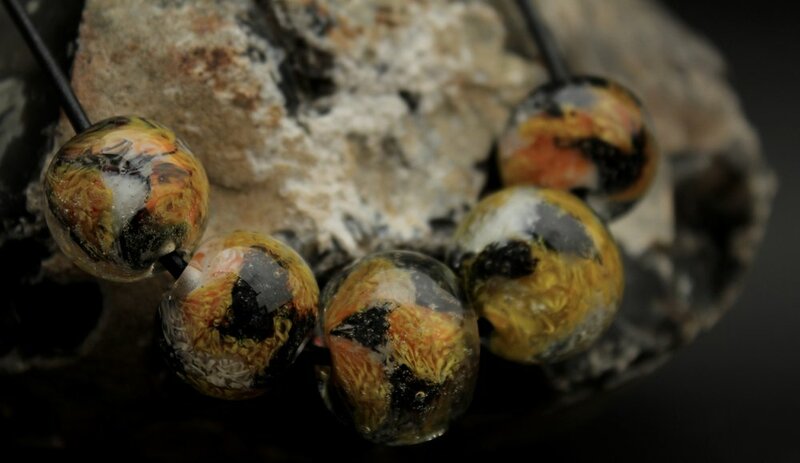 The real finished look of the bead only becomes apparent when they come out of the kiln and are cool. While we were in Greece last summer we had two fantastic sailing guides Mihai and Monika. 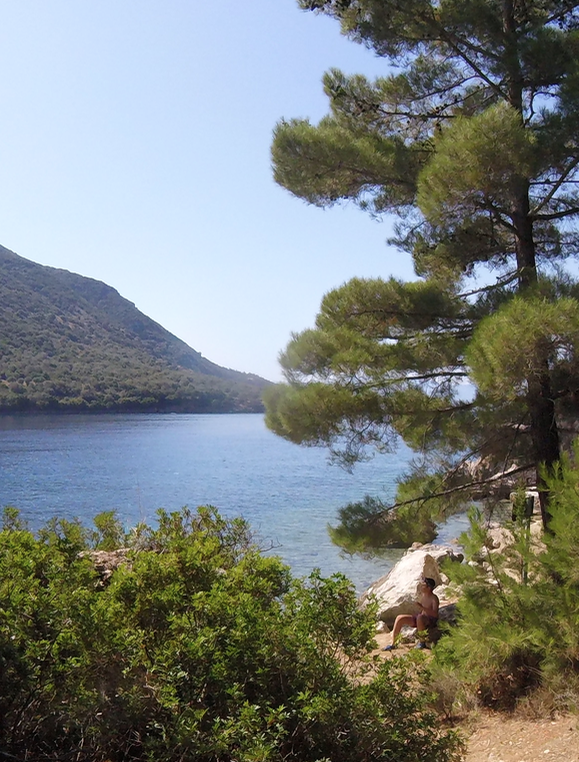 They shared with us their favourite place 'Ormos Polis' which is one of the most tiny and beautiful coves in the Ionian. Beautiful crystal green water , coupled with all kinds of sea life, pools and little caves made it a magical place to spend a wonderful couple of days. I promised back then to make Monika a special bead that would remind her of Polis Bay forever. Well finally I am about to send it off to her. I hope she likes it. It was important to get that lovely sea green colour right, and I must admit I did not get it right first time!! I started with a core of ivory glass for the rocks and then used layers of transparent green and blue glass to build up the feeling of the deeper water. I used some fine silver foil to bring the reflective quality of the water to the bead and then worked on the details of the colour changes as the water becomes shallower towards the shore. The final bead on it's way to Greece! The last picture is of Tommy having a final chill before we jumped back on the boat to go off to the next destination! Could do with a bit of that sunshine today in England, bloomin' freezing right now! Beads full of summery freshness! I have been playing with some little floral fresh looking beads to make some necklaces and bracelets. Sometimes the simplest of things can be really effective. The emerald green, white and warm yellow combination really looks great with a nice crisp white linen shirt, and the clear glass adds to the sense of freshness and clean-ness and clarity! 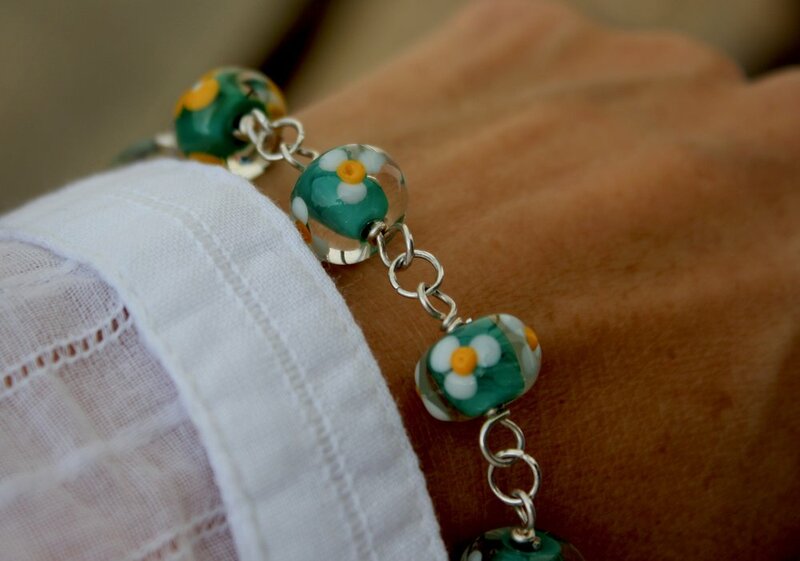 Look at my video to show how a little flower bead is born! 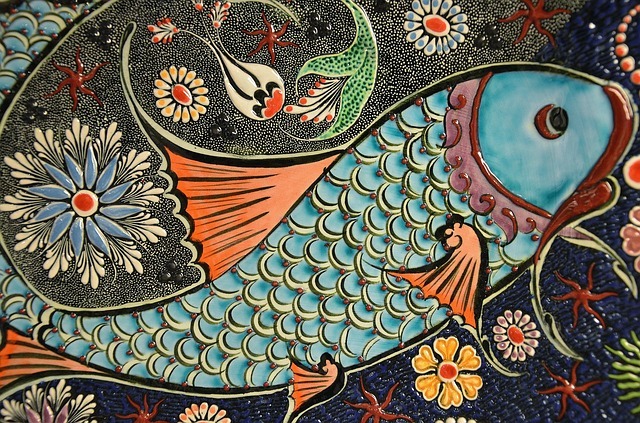 I love the mixture of colour and textures.. So the beads that I made could not argue with the dress at all and the colour palette had to remain really subtle otherwise the jewellery would completely overpower the dress! Here is the dress and a close up of the fabric. You can see that what ever jewellery is worn with it has to work with the colours of the fabric itself and the colours of the shadows that naturally fall as the dress is in two layers. The holes are quite defined on the bare skin part of the dress as well which means that my client's skin tone will also alter the look of the colour too. (My client has a good tan at the moment which means there is a more caramel look to those parts of the dress which needed to be taken into account). And here are the earrings and mega charm pendant bead shown on a classic necklace and on the new Fantasy style necklace that I made. We went very simple with the earrings. I chose some simple Swarovski Crystal beads and made them into earrings using sterling silver earwires. This bead is over 20 mm in diameter. It's got lots of colours and spirals going all the way round. I have always loved dragonflies and I wanted to use them as an icon for my glass work as they stand for lightness, elegance, freshness and colour which are the kinds of values I want to imbue in my glass. Meadowhawk was perfect as a brand name for my company. I loved the sound and connotations of the word 'Meadowhawk' on it's own. It's all about naturalness and the countryside and outdoors but more importantly a meadowhawk is a kind of dragonfly. We call them 'Darters' here n the UK. First all I have to make a selection of wings. Sometimes I make them totally clear, other times they have wispy bits of black in them and other transparent glass colours to suggest the little veins in the wings of a real dragonfly. They don't look much like wings yet do they? Hee Hee! The other day I got a little commission request for a memorial bead, so I thought that it might be nice to show some of my memorial beads and explain a little bit about them. 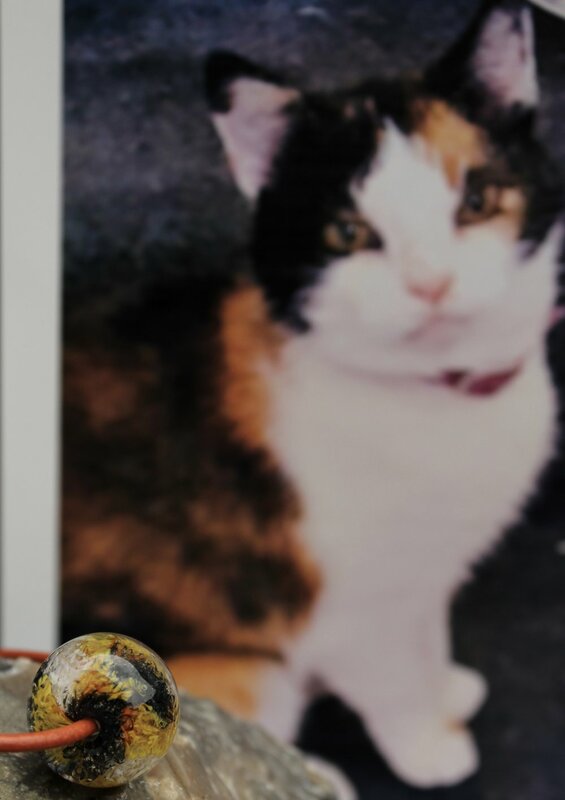 When someone loses a close relative or a beloved pet there is a real need for some people to keep a little memory of them close to their heart. I know this all too well as when my beloved Dennis died (our eleven year old chocolate Labrador) I kept his ashes under my bed for a year before I finally decided to do something with them. 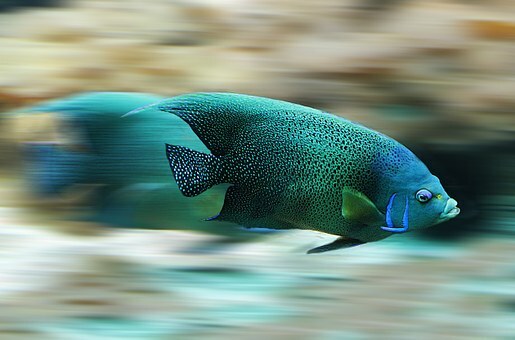 I just felt happy knowing that he was near me every night when I was asleep. It gave me the connection with him that I still really needed even after he had passed away. It is possible to encase fragments of cremated ashes within glass and I have some beads that I've made in this way here to show you. By doing this a little piece of your loved ones can be kept near you at all times and any time you want to you can look at them and remember them. It's also nice because they give you a tangible reminder that you can actually hold in your hand and touch which is very comforting! The memorial pieces don't have to necessarily be jewellery. Men for example might prefer a little glass pebble that they can keep in a drawer or even in a pocket. or little bead on a string or ribbon which is simply intended as a keepsake rather than a bead to be worn. That's enough chat. I will let the beads do the talking for the most part! This is a colour-changing 'Silver Glass' pendant. You can see the little swirls of ash encircle the bubble. Here is the same pendant with a matching set of charm beads. This one has a kind of Galaxy/Space kind of feel about it.... It was made big enough to be worn as a pendant on a cord or leather thong. 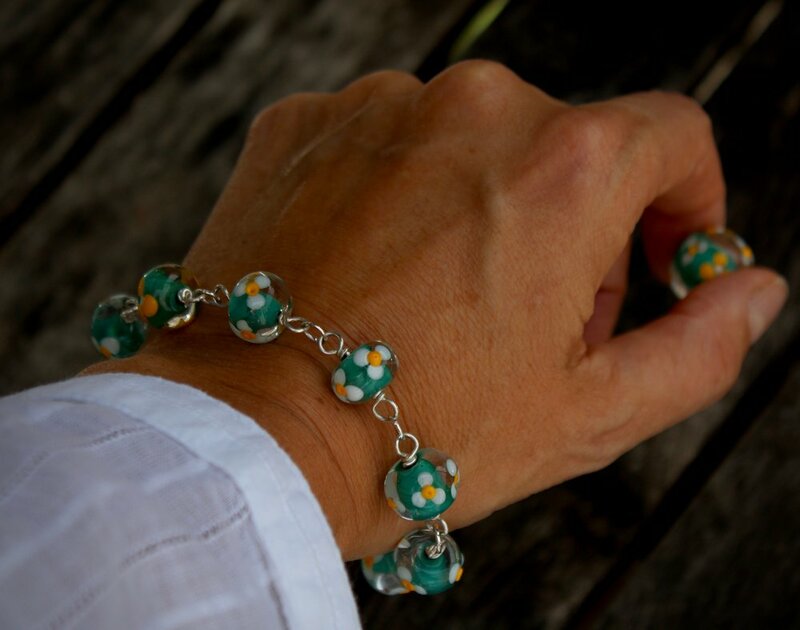 Alternatively it can be worn on the wrist like a regular charm bead. This one was such a beauty, I couldn't leave it out! This picture shows a pretty good close up of what's going on inside the bead. I love the design that the ash helps to make inside. Each one is so individual and unique. The last set shown here are much more simple in style and the ash particles are more visible in some cases. These ones I like to call 'Clarity'. Even though they can be made in all kinds of colours I think blues, greens and purples look the best. This one is a pretty bluey/pink colour. I hope you have enjoyed having a look at these. 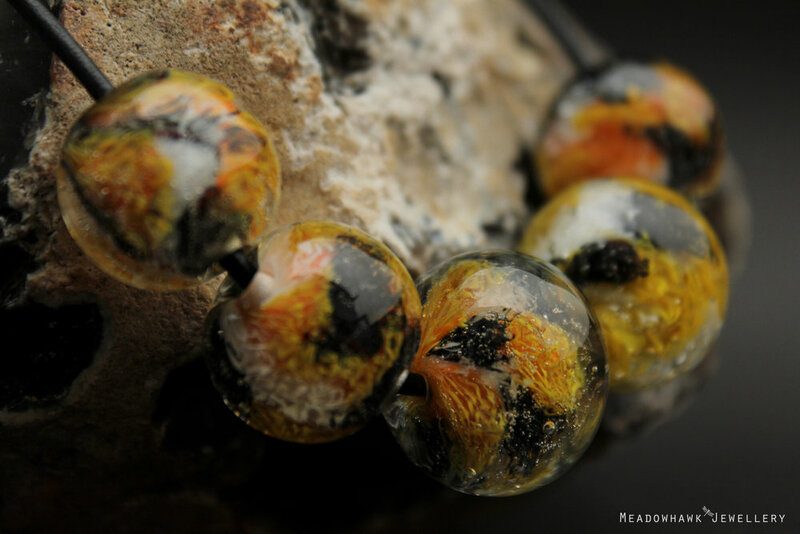 I have been having a little fascination with these pebble beads recently. Ive made three different sets using the same technique and I don't think it's out of my system yet! It's quite neat as you use 3 colours only (in this case Turquoise, Black and bright Red) Then you use them in rotation to make a set of encased beads. 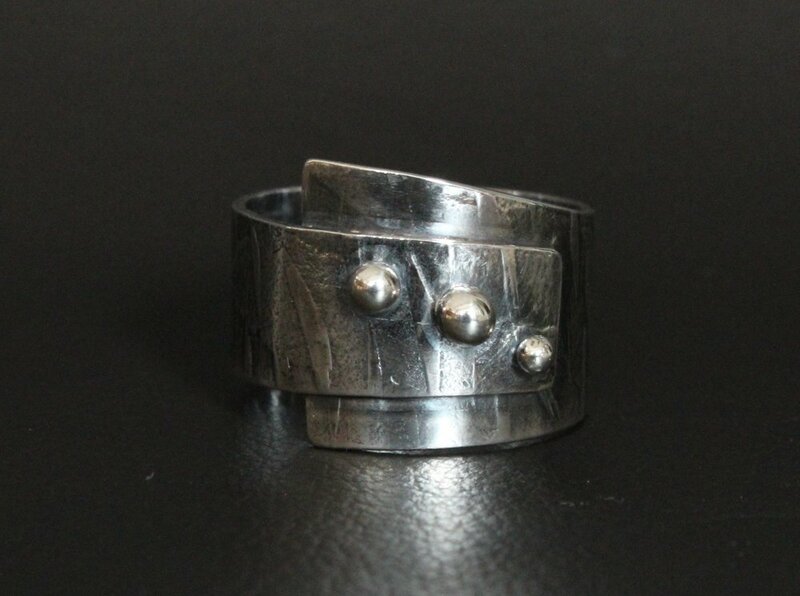 I love the way the ringed dots 'float' on the surface of the clear and give the bead more depth and shine. I loved the shape of this pendant. A lovely cylinder with curved edges! Here's the brightly coloured chunky pendant. It looks stunning on the wrist! This was the alternative pendant. A more characteristic pebble shape with a bit more texture on the outside! This one was the one everyone fell in love with. The colours are Ivory, Stone and Ebony! It looks very classy on the wrist! And the other thing I did was to add a beaded extender - so it can be worn as a necklace! Clever eh? The last one for today was made around the time that Princess Charlotte was born. This bracelet is made up with a pure sterling silver clasp and findings and it's good old patriotic Red, White and Blue! So just a few sunny days ago, I took the most glorious walk around the woodland trails at Cliveden which is a National Trust treasure of a place near me. The woodland was full of these beauties. The air was so fragrant with their scent; it was quite magical! I was captivated by the colour of the bluebells the mauve and blue tones merged almost imperceptibly but still I was aware of the two lovely colours and the many shades of those colours that made the bluebells so stunning. Just had to try to capture the colour, depth and shading with the glass! I used layers of lilac, dark lavender, light blue transparent, intense blue transparent and touches of Thomson enamels, CIM jellyfish and crocus plus a bit of periwinkle opaque glass. I knew that in some frequencies of light the dark lavender and crocus changed the way it came across. It sometimes looks mauve/pink and in other lights looks completely blue/grey. 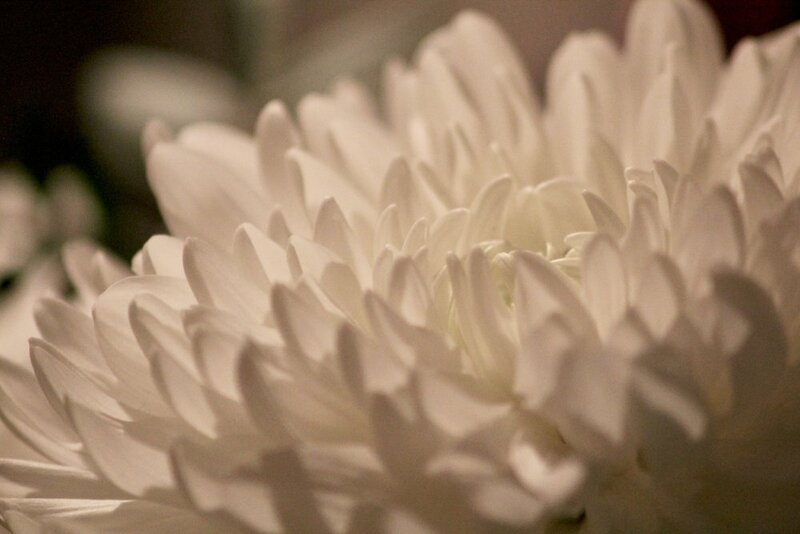 This in the set under tungsten light. you can clearly see the gradation in the middle bead from lavender to pink, but in the next picture on the the same bead looks completely lilac. It's the same bead..Funny isn't it? I was very pleased with them - so much so, that these little ones are keepers!!! I know...... naughty aren't I ;-) ? Here are some more glossy photos. But in order to light them up properly I had to use my studio lights which meant that some of the pink tones were lost. Anyone who has some really good camera knowledge could maybe tell me how I could have done it better and managed to retain the pinker hue? This one was pinky mauve on the inside with a tiny dusting of enamel on the surface and the bobbly one was pinker inside and blue on the outside to get the dual tone. I love the sparkly one below. It also has two layers. You can see as the light passes through it that the pinker/mauve shines through. This is going to be a really quick and snappy one! I just wanted to get these little beauties logged onto the blog. The photos came out so great and the colours really pop! Recently I've been working on my pinks and purples for a project and just had to do a set of simple charm beads that used the entire colour range!